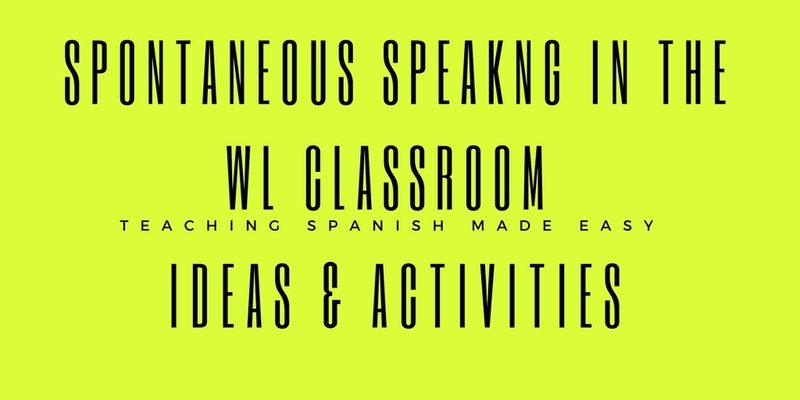 How Do We Encourage Spontaneous Speaking in the WL Classroom? Like this! was thoroughly intrigued by Amy Lenord's post on The Power of Just Talking. Not only because I agree that it is a good practice, but speaking is the "core" of what we do in this "labor of love." We give copious amounts of input, engage students in a wide range of language-building activities so that they can speak, and do it somewhat naturally. However, sometimes as language teachers, we over think things. I certainly do. Amy's blog post The Power of Just Talking resonated with me and challenged me to think more about this 'gift" that students already have. And don't worry about them making errors- we learn from our failures, and we fail forward. Spontaneous speaking has always been at the forefront of my teaching philosophy, but not for pedagogical reasons necessarily. I've just always been interested in what students had to say, and their thinking on a particular subject. With the increased social climate of their lives, this generation is even more wired to speak, share their stories, even if they have not had sufficient input to do so; they will "make do" and this is where the creative power of using language comes into play. I have had many a conversation in class where students have coined new phrases, or have said words that they did not know they knew; in part because of the input residue on their brains, also intuitive knowledge of Spanish/English cognates. Some kids have told me "it just sounded right." After conversations like this, their confidence soars because they are using their building blocks to communicate. Sometimes we stop short of allowing this practice because we think that students need more input, but sometimes we have to allow them to utilize the input they have (use it or lose it) and creatively navigate the world of language. students having enough vocabulary, a combination of nouns and verbs to hold a conversation. Having something to "unload" is key. We want to make sure students have had enough input, but we don't have to give them all the input in the world for them to "flex their muscles." This is where we as language teachers have to let go and let the kids. The spontaneous talk prompts (spontaneous for them, not us) should be suited to their level, connected to what they already know. This is honoring the great body of L2 research on the matter. However, it can be a bit challenging (input+1) to push them just a tad. This challenge automatically puts them at the top of the Bloom's pyramid because they are creating, synthesizing and engaged in meaning-making, which is a feat in and of itself. Perhaps, in novice-low context, this may not work, but as novice-mid and beyond should be able to handle a conversation at their level. For my novice-low to mid students, we are currently working on describing ourselves and others, after that we will learn classroom vocabulary, learning about family, etc. Below are some basic prompts to get them talking. This can be done in a spontaneous manner. ¿Quién en tu familia es muy gracioso? ¿Cuáles son los app que necesitas todos dlos días...tu vida no puede funcionar sin el app? (o aplicación). ¿Cuál es tu programa favorito o serie favorita de television? Canta "Feliz Cumpleaños" a tu compañero. ¿Quiénes son las personas en tu familia? These are just a few questions to get them talking! Playing "Just a minute." Give students a topic and they have to say everything they can about the topic in one minute. With novice-low-mid, I'd probably do 10-20 seconds. But I love this activity because students can dig deep. I always allow them to use their notebooks in the formative stages, and I have the classroom walls outfitted with vocabulary. Check out Amy's Expresate Wall Hangers. Providing students with literacy mats- I called these "Fluency Tables" in my class, and they are awesome. It is not a bad idea to show students how to talk spontaneously. I think modeling it a few times could allow them to see that they are the missing ingredient. Their creativity is what we crave, and for teachers, we this is good feedback for us to adjust instruction to meet additional needs that arise. Having key phrases on the wall on a Literacy Mat would empower students and generate to some degree automaticity. 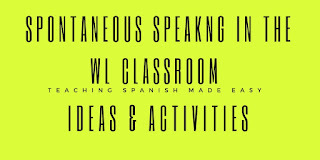 ¿Qué harías?- there are really cool situations here where students love to chime in! My big takeaways, and adding "mi granito." As Amy Lenord pointed out in her blog post The Power of Just Talking, she started the conversation just by asking about their week, their classes, etc. With the input that students have been provided over the past months and years, these questions tapped into to their ability, as well as their adolescent need to express themselves. Start small and scale. In the IB world, we discuss Global Contexts with students. These are ideas for framing the global connection to the curriculum. In workshops, I usually show teachers pictures and have them guess the global context. However, this could be a great activity overall for students. Showing them a "meaty" picture or video where speaking is utterly irresistible! I did this with an English video with Spanish subtitles. The language is not really important as the content transcends language. This video is part of my "Identity Unit." Using writing as a catalyst for speaking could also be a good way to involve students. It is not totally spontaneous, but they get a few minutes to think and then speak. I use quotes or statement to get students thinking. For my unit on Relationships, I always post the question "should students younger than 16 be allowed to date?" Boy, did I get an avalanche of opinions! How do you engage students in spontaneous conversation? Let us know!